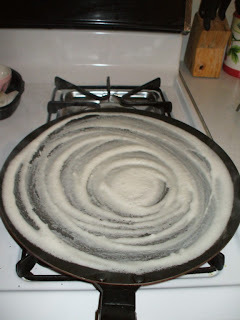 kudambuli/kudampuli: Make Dosa with Rice Flour! 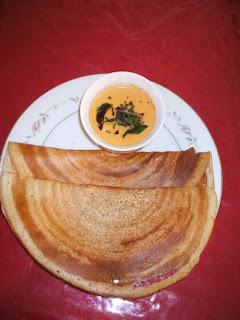 Make Dosa with Rice Flour! 3. Mix well rice flour and urad dhal with sufficient water for dosa batter. 5. Keep it overnight to ferment.In the cold weather for fermentation u can pre-heat the oven for 350F for 10 mins.Switch off it and keep the batter inside. 6. Heat dosa pan . 7. Pour one spoon full of batter on a greased frying pan as thin as possible. Serve it with coconut chutney or sambar !!! Belive me, its super eassy and tasty too...,preheating the oven worked really fine, So u can have Dosas even on a bad weather. Try it guys You ll know urself!!! Can u post the recipe for Rava Iddli..
Renju and shiji,thanks for the valuable comments! thnx chitra for this recipe..i wanted to make idly and dosa with rice flour but was unable to find the recipe.Now i am going to try your recipe of dosa.Can you please post the recipe of idly with rice flour also.